A gap up on extremely heavy volume can usually ignite a very bullish move in stocks. It is not unusual to see stocks double or triple after these kind of gaps. A gap up usually shifts the mindset of market participants about the stock. When a stock gaps up, it also causes many short sellers to cover their short. If the stock gaps up above a trading range or resistance area, it gives the stock lots of free room to move higher. The heavy volume that accompanies the gap up shows money is committed to the stock. Many investors or traders who see the heavy volume will also jump in the bandwagon and push the stock higher. Stocks that gap up on heavy volume can often double, triple and even quadruple in a few weeks to a few months. 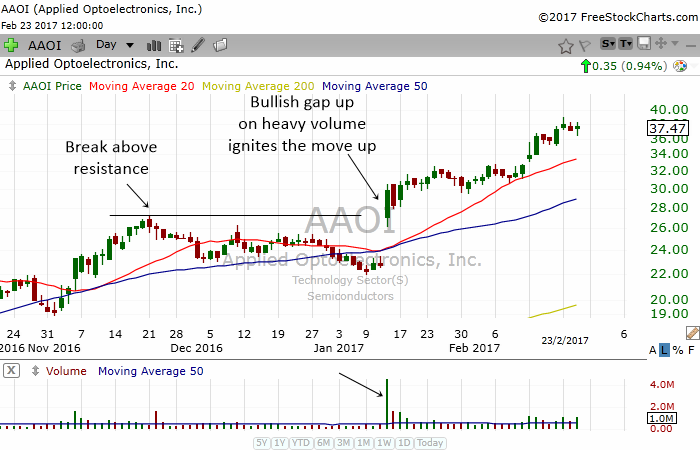 In the chart above, AAOI had a big bullish gap up with unusual volume. We know that this stock had unusual volume because the volume spiked up. The blue moving line on the volume shows the 50 day moving average of volume. Look how the stock's volume spiked up. The average volume is about 500,000 but on that day, the volume was 4.4 million shares. This shows us that the gap up happened with 9X more volume than the average day! Heavy volume shows commitment by buyers and covering by short sellers. Notice also that AAOI gap up and moved above resistance area. When a stock overcomes a previous high on heavy volume, this tells us that it is a very strong breakout. Eventually the rose to $37. The stock gained about 70% from before the gap. 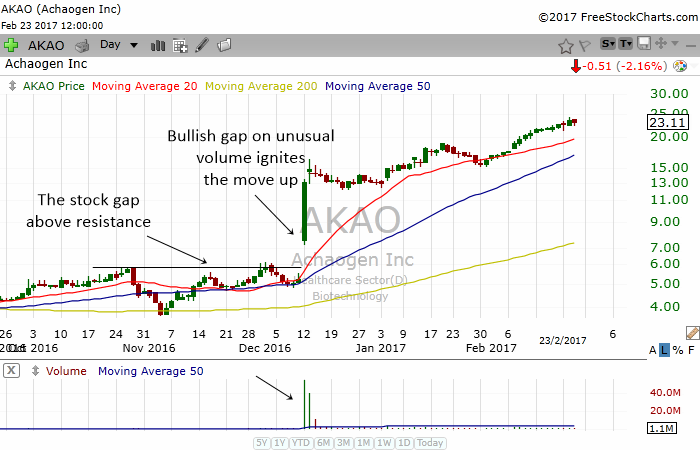 The chart of AKAO above is another great example of how gap up on heavy volume can ignite a bullish move in a stock. The stock gap up above resistance in mid December on unusual volume. From there, the stock slowly drifted higher. This stock had a 350% gain in less than 3 months! 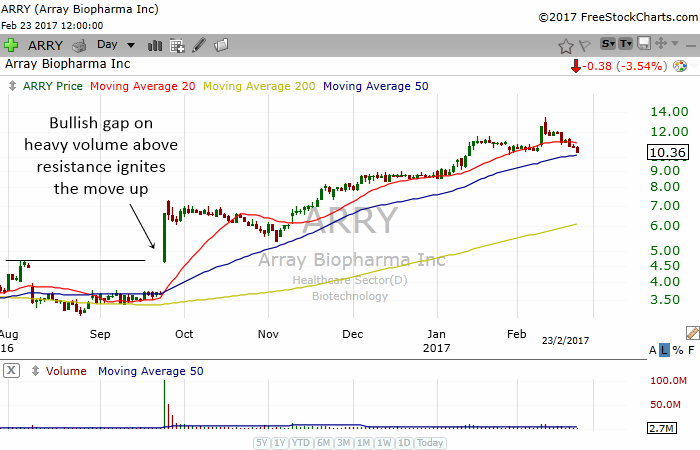 In the chart above, ARRY had a big bullish gap up on heavy volume in late September. The stock also moved above resistance. Look how bullish the stock was. This stock gained more than 170%! 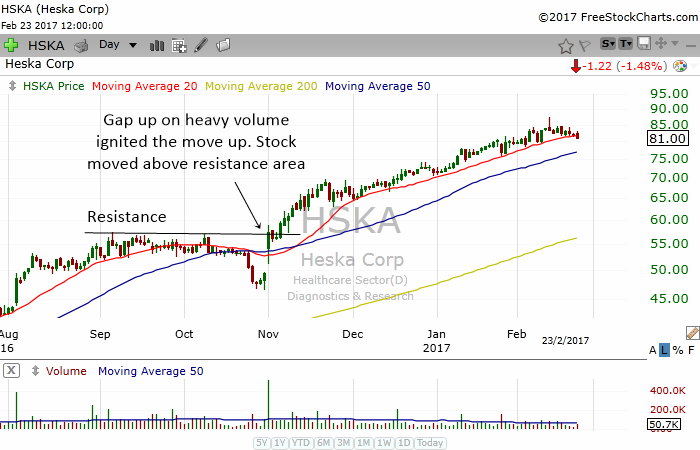 HSKA had a bullish gap up in November on heavy volume. The stock eventually overcome resistance and moved higher. What an impressive gain this stock experienced. Gap ups can also occur in sectors. A huge gap up with unusual volume in sectors usually happens because of a major event or catalyst. 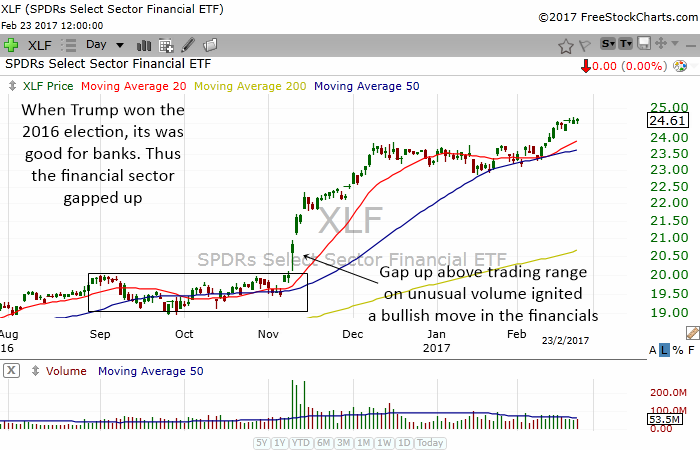 The chart above shows XLF, the etf representing the financial sector. On November 7 after Donald Trump won the US Presidential Election, the etf had a small gap up. The next day the etf did not move much. It was still within the trading range. Then on Wedneday, November 11 2016, the financial sector had a huge gap up on very heavy volume. 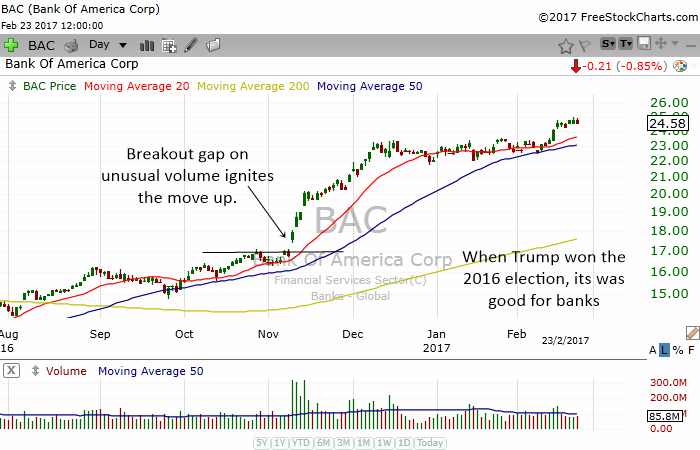 The reason why the financials did not gap up on heavy volume after the election may be because investors and traders were still digesting the effect of a Donald Trump win. When the markets finally decided that The Donald was good for financial stocks, people rushed in to purchase bank stocks. You can see how the financials moved up after the election. The chart above shows one of the beneficiaries of the Trump win. 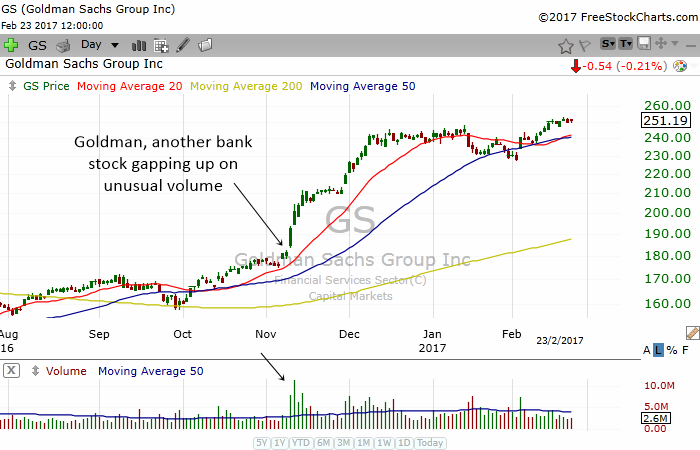 Bank of America exploded higher gapping up unusual volume. BAC then had a very impressive bull run. The next two charts below show two other banks that had a big bull run after they gap up on unusual volume. 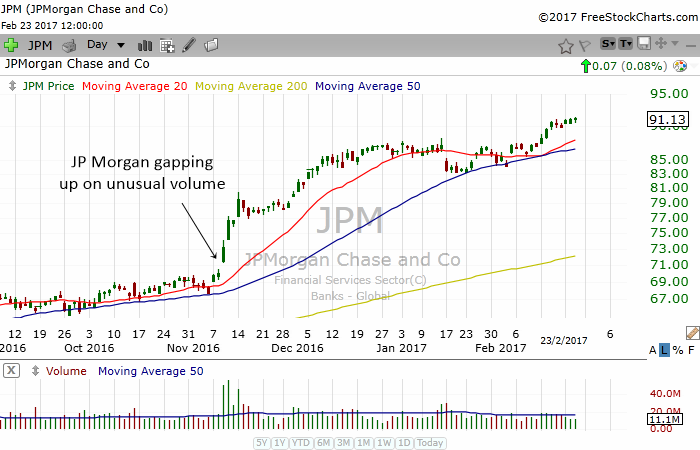 Goldman Sachs and JP Morgan shot higher and experienced a very nice bullish move. The next time you see a stock or sector gapping up on unusual volume, put them in your watchlist. Who knows, they might even double or triple in price.